In February, members of the Columbia legal community took part in a disaster poverty simulation coordinated by the American Bar Association and held at the South Carolina Bar Conference Center. 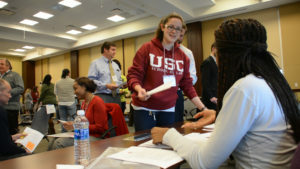 Among the participants were students and faculty and staff from the University of South Carolina School of Law. 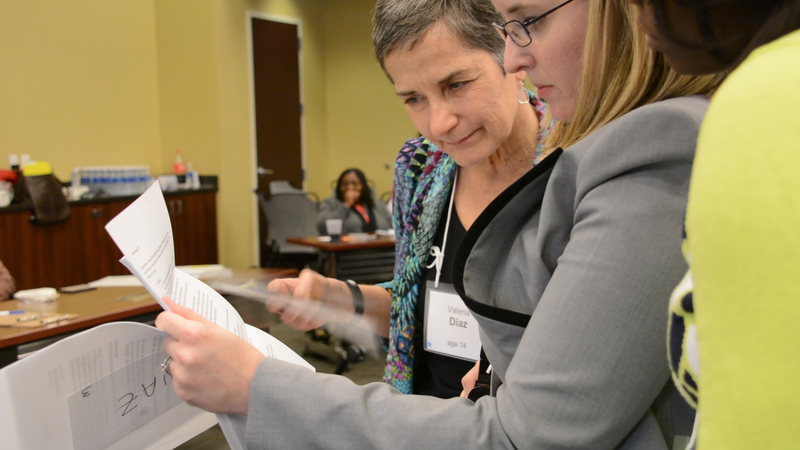 Through the use of role-play, the simulation provided an opportunity for the legal community to walk in the shoes of those living in poverty and gain a better understanding about why some low-income clients make the decisions they do. “This isn’t even really ‘a day in the life.’ We call this just dipping your toes into the experience of so many people in our country,” said American Bar Association Disaster Poverty Simulation coordinator Alicia Aiken. It was also a chance for participants to learn how they could be more effective legal aid and pro bono attorneys, as well as identify ways to improve responses to those in need. Ultimately, the hope was to equip participants with a more compassionate and understanding perspective of this population and the problems they face, especially when catastrophe strikes. “It is our goal to educate the legal community, as well as the entire community in various states across this country, about the importance of preparing for disasters and how to recover from them,” said Chantis Floyd, chair of the American Bar Association’s Standing Committee for Disaster Response and Preparedness. Columbia was chosen by the committee as one of the simulation sites because of the historic flooding that occurred in 2015. Participants read about their character’s backstory before the simulation begins. The two-and-a-half hour simulation was broken up into five “weeks,” with each week lasting approximately 15 minutes in real time. 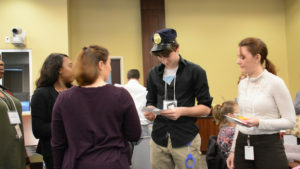 When attendees entered the simulation, they were given character profiles, including their character’s name and a brief backstory of their experiences. They were then broken into teams, each with a family name and the goal of meeting their families’ most basic needs. Volunteers took on roles as bank representatives, social service workers, day-care providers, legal aid attorneys, grocers and employers, all offering services or goods the families needed to survive. But just like in real life, not everyone enjoyed the same privileges. For instance, a police officer patrolled the simulation, stopping families and demanding to see social security cards for each member. Those families who were never given identification cards were evicted, denied employment, or even taken to jail. For children, each day began with a trip to school. Before entering the classroom, students had to present a slip that proved they had eaten dinner the night before. Those slips were acquired only when their parents visited the grocer, or took them to “Bonnie’s Burgers,” the local fast food chain that was in walking distance from their house. Without the slip, students had to return home, forcing parents to miss work and consequently have even less money for that night’s meal. Police officers patrolled the simulation. What’s more, some of the characters were given name tags with colored dots. Each color corresponded to how the volunteers were instructed to treat them. Red dots were for those considered to be shiftless or lazy, and always looking for a free handout. Characters with green dots were viewed as dangerous, or possibly wanted by the law. Blue dots were for those seen as a best friends, or trusted people. “The dots are relatively new to this simulation in particular, and it’s to help understand implicit bias,” said Sharon Terrill, program specialist for the ABA. First-year law student Brooke Hiltbold was assigned the character of a 24-year-old man, who lived with his girlfriend and her one-year-old from a previous relationship. Hiltbold’s character was employed, doing seemingly meaningless jobs such as stacking chairs, organizing water bottles and counting the carpet squares in the SC Bar conference room. But Hiltbold, who had a green dot, found that no matter how efficiently she completed a task, her character was challenged, as her employer assumed she was doing something wrong. “My very first day at ‘work,’ they immediately started making snide remarks,” said Hiltbold. As a 10-year-old boy, with a red dot, first-year law student Alex Zimmerman felt his character was being looked down on by the school principal, played by Susan Kuo, the associate dean for diversity and inclusion and a professor at the law school. Professor Kuo played the school principal to “children” like first-year law student Alex Zimmerman’s simulation character. In week three of the five-week simulation, a hurricane hit the town, knocking out power and closing most businesses. Schools were turned into shelters, giving those families who relied on public school for child-care a new obstacle. Some of the families’ homes were randomly deemed unsuitable for living, forcing them into shelters or neighbors’ homes. Others were told the storm injured them, making them unable to work. Throughout the simulation, almost every character was forced to make hard decisions in order to meet their family’s immediate needs—even when it meant negative consequences in other areas of their life. And for so many, trying to get legal aid was nearly impossible because of the circumstances or biases stacked against them. 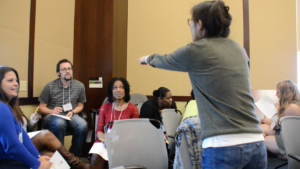 At the end, all of the participants came together for a discussion about their various experiences, and to try to find ways to better address the issues, or identify problems that proved more important than previously thought. “Everyone started working together to recover after the disaster hit. They were sharing information as well as personal resources. I hope people learned that our vulnerability and resilience in times of disaster depends not just on economic factors, but also social factors,” said Kuo. Hiltbold’s character was unable to get legal services after she was injured during the hurricane. Hiltbold said everyone should should go through a simulation like this. This entry was posted in Colophon, Noteworthy on 2 March 2017 by thefineprint.